Whether you’re going to the beach or cross-country, summer is a popular time to load the family in the car and hit the road. It is important to observe proper road safety for your four-legged family members as well as the two-legged ones. Here are some safety tips for your pets. 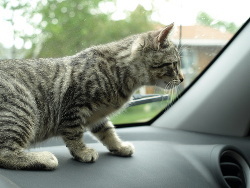 Everyone – cats, dogs and humans – should ride inside the vehicle. While it may seem like fun, no one should not ride in the flatbed of a pickup truck. Cats and dogs can fall out of moving vehicles, and the impact with the road can cause roadburn and broken bones. Dogs who have been tied to the flatbed will be dragged behind the truck, causing severe roadrash or death. Keep your hands and arms (and head!) inside the vehicle. Many dogs like to stick their heads out the car window and catch a breeze. While this may be a lot of fun for your dog, allowing your dog to stick their head out the window is not safe. Eye irritations, resulting when insects or debris fly into Rover’s eye, are the most common injuries. Just think of how bug-splattered your windshield gets – and remember, motorcyclists wear helmets to prevent these sorts of injuries! Rock or gravel kicked up by other vehicles could strike Rover’s head, resulting in lacerations or concussion. Most dangerously, Rover could be hit by oncoming traffic or by objects along the side of the road, resulting in lacerations, concussion, broken bones, or even death. So keep all parts of Rover’s body inside the car: a little disappointment is better than injury. The same safety concerns apply to pets as well as to humans: travelling in a moving vehicle without a safety restraint just isn’t safe. Seat belts are available for dogs as well as for humans, and will prevent Rover from flying through the windshield in case of a sudden stop. Additionally, unrestrained pets can distract the driver by climbing onto the driver’s lap or into the foot well around the pedals, hindering your ability to drive safely. Cats and dogs who do not use a seat belt should ride in a carrier or crate that has been strapped down so that it will not move in the case of an accident. Pets should be safely secured and (like children) should travel in the back seat of the car. Vehicles heat up very quickly in the summer, even with the windows open. If you leave Rover or Fluffy in the car, even just for a few minutes, they can become overheated very quickly. Unlike humans, dogs and cats can’t sweat to cool down, they pant. Heatstroke in cats and dogs leads to respiratory difficulties and organ failure – elevated body temperatures essentially cook internal organs. Take your pets with you when you park the car or let then wait outside the car in the shade if they can’t go into the store with you – the summer heat is deadly! Wherever your summer travels take you and your pets, a little caution will make your journey safe for all. So when you head out to enjoy the summer sun, remember to buckle up, drive safe, and keep cool!